There’s always room in our studios for the best control surface. When it comes to needing to sync up our pieces of equipment to the digital audio setup in front of us, you can never have too many options to get a true custom feel of what we’re working with (at least in our opinion). As we continue to review the top models in the audio equipment game, today we’re met with a category that some of us producers, engineers and mixers can’t live without. Let’s check out what we found for the top 10 best control surfaces in the market today. What is a control surface? A control surface is an external piece of audio equipment that allows you to control the digital audio workstation or other types of software you have in front of you via a computer. It’s a definitive piece of gear in the world of digital technology when it comes to producing, mixing and mastering music. They’re typically hooked up to your rig via USB, FireWire or Ethernet, while some coming in sizes that are even portable for live performances or hooking it up at a fellow musician’s studio. Like any external gear, especially when it comes to “controlling” your software, sounds and effects, these help us continue to blend both analog and digital setups as we use computers yet steer away from mice and computers at the same time. It just isn’t the same trying to fix levels with our mouse — that’s why we’ll never truly steer away from analog gear, even if it’s a small and simple USB-connected device to give us a more hands-on feel and control to our music. These things come in numerous variations, with different shapes, sizes, capabilities, features and price ranges. 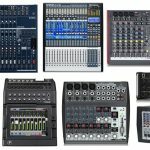 Many may even consider a few of these as audio mixers to some. 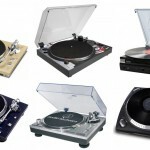 We know many who like to pair these up with their MIDI keyboards and other various MIDI gear to complete their setup. So now that you know you need a “control surface”, we’ve only scratched the surface in what exactly you were thinking. This term covers a pretty broad range of audio gear. Do you need some faders to control your FX? Knobs for levels of many different types of tracks? We’ll list the essentials below when it comes to finding the best control surface for your current (or future) music creation lab. Budget range – As with all music equipment, we’re going to see quite a bit of a price range with this one. Your cash flow is really going to determine which direction you’re going to take with your money, or if you’re planning on saving up, which to eventually end up in. We recommend being patient with your budget if you find a model that’s a bit out of your current thoughts and expectations when it comes to money. We tried to find the best control surfaces in most price-points to give you options, albeit we’ve seen models range from below $100 all the way to above $1,000+. Your intended use – As stated previously, the word “control surface” is quite broad. 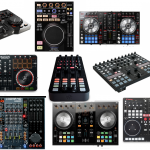 What you’re planning on using the control surface for will help us sift through the different types of knobs, buttons and faders many of these come with. Are you in a home studio needing some simple control of your FX, virtual instruments and other various DAW settings? A live performer needing multiple channels and real-time efficiency to hook up to their laptops? How about a professional needing a mammoth to use in their mixing and mastering endeavors? Since we were only limited to 10 models today, we tried to cover as many bases as we could. Extra features – Although your intended use will determine which “features” you’ll need, many of these come with slight additives that don’t necessarily make or break your purchase. For example, we’ve some come with extra LED light notifications (great for performers), touch sensitive controls as opposed to standard hands-on makes, LCD screens, footswitch ports, multiple channels, mixing abilities, and more. Which of these seem worth the money will determine on your own individual needs. To start off our list, we have now one of the most popular control surfaces in the market for home studios and the like. The Akai MIDImix is one of the best control surface picks out there, and it allows for a durable and portable compact hands-on feel that is not only creative with an ability to mix but also have full control of whatever workstation the artist deems fit. The simplistic design of this control surface allows for mobility for the musician to create music and play while they are outside of their home or office. With this Akai technology, it allows for a greater performance mixer with a sound 8 individual faders, including a master fader and 24 control knobs. You’re also getting 16 buttons arranged in 2 banks (they provide a solo, mute, and record arm function each channel), a ‘single button press’ feature to send all mixer settings straight to your DAW, and great integration with any software you’re using (although they advertise be seamless with Ableton). This maximizes the opportunity to allow a natural and unique sound, but most importantly this is the best control surface for a smaller studio or portable mixing while on the go. Our Akai MIDImix review sheds some more light on the surface. The Novation ZeRO SL MkII is a redone creative new version of the former keyless controller, which has been well-regarded as one of the best control surfaces and is similar to previous controllers of their SL line. This device is simple and ideal for use in the comfort of your studio, at home or when performing. The greatest reviews of this product have come from those who play in particularly loud settings which equips the artist to have a premium sound quality. The real underestimated beauty of this product is how easy it is to set up. Often times, it take a musician several minutes to set up their controllers, but this allows for a quick setups within seconds. This control surface also comes with a rather large, 144-character ultra-bright LCD screen that contains all parameter names and values. 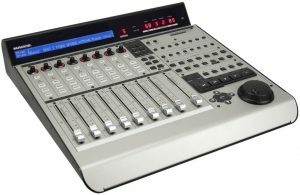 In addition, it comes with a well-equipped crossfader and a touch sensitive speed dial and knob that can certainly be used to change the value of any parameter in which the cursor selects or deems fit. High quality in its nature, the Avid Artist Control v2 is one of the best control surfaces around if your budget is high and you’re near professional in intended use. Now we’re starting to get out of the budget-friendly and home studio use. Growing in popularity, this product allows for better control over too-many-to-count features and tweaks. With the ability to record tracks from the surface, the Artist Control creates the ability to not only solo select but also mute tracks. In addition, the Artist control gains hands-on command over any integration that goes unmatched with any EUCON-enabled audio and video applications. By simply pressing a button you are enabled access to functions and settings using the built-in touchscreen. Some other highlights of this beast include touchscreen control, easy navigation with the jog wheel and transport controls, and ‘Soft Keys’ for additional custom assignment. Another aspect of the Artist Control, is that you are less susceptible to losing any previous work or creative focus, therefore, the functionality there is much more to this product than the cursor and keyboard alone. This feature is the gold standard of one of the best control surfaces on the market. They’re the creator of Pro Tools, after all. The Behringer X-Touch has relatively large 9 fully automated sliders and is an overall touch-sensitive control surface has been hard to pass up for recent artists and music producers. Well known for being great for beginners and intermediate producers, this surface also entails 8 rotary controls that come with LED-Collars for adjustments that are quick to use with your any of your favorite parameters. The surface itself is an Ethernet interface for real-time protocol. This product supports HUI and Mackie Control protocols for any of the seamless integrations. In addition, they come with pretty much every compatible music production software. The surface is 8-segment LED meters per channel for quality level control. The footswitch connectors that come with this musical surface are 2 dedicated connectors along with one-foot controller that has been placed for external remote control. State of the art controls that are easy to access are a typical selling point for this product. 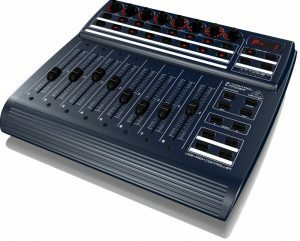 In a continuously growing industry for music products, the Behringer X-Touch is one of the top-selling control surfaces in the world and is in many stores nationwide. There’s also a smaller and cheaper version if you want to read our X-Touch Mini review. This impressive controlling musical product is easy to contain as it is often carried in a compact case that can be compared to one in which you would carry your portable computer. The Nektar Panorama P1 is now considered one of the most comprehensive and most detailed MDI controllers in the market by many. 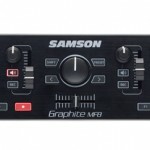 This control surface itself comes with 945mm faders and 28 buttons that comes with a foot switch jack that gives you greater control of the various parameters and any time. There are 61 parameters 16 encoders and 10 LED buttons, making this one of the most exciting and best control surfaces being sold. This clear 3.5 color display allows for the user to have an easier time obtaining the information in which they need. The display also comes with more information that clarifies any workflow that is necessary. 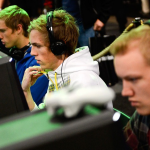 Panorama simplifies all controllers and allows for operations to become simply put less complex. Whether you are programming assignments or using for fun, the Panorama P1 is one of the most simple and enjoyable best control surfaces for all users. The Korg nanoKONTROL 2 takes a break from some higher-priced models and enables the user to have an easy to use relatively small controller that can fit in directly in front of your laptop computer. A lot of software often times do not come with the features that this controller comes with, including control selection that allows for easy transportation. All the buttons that come with it ensure useful information making this one of most dynamic and best control surfaces . The color comes in either black or white and provides a larger than usual knob, fader and three switches that provide easy access to each of the eight channels. In addition, this control surface comes with a marker button, which allows the user an easier time assigning marks. The main difference between the Korg nanoKONTROL and other control surfaces on the market is the arrangement of the software synthesizer. Parameters are significantly easier to be assigned to whatever control the user needs for easy control. The knobs and faders are well known for a higher frequency along with resonance. It’s one of our favorite budget-friendly control surfaces out there is amazing if you’re always on the go. The Mackie Control Universal Pro (also commonly referred to as the MCU), is a more commonly referenced modern DAW software that is for the most part unlimited in opportunity when it comes down to collecting audio and changing aspects of your work of art. Geared towards the pros or those who know what they’re doing, this is one of the best control surfaces that is easy manipulate any music and adjust the tones to a sound that appears more organic and less forced. The controllers come with pre labeled Lexan overlays that are particularly popular for applications. 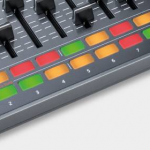 The faders and knobs are easy to access and align with the surface. The setup of the product is your typical plug in to the wall USB that comes with almost any DAW. This control surface is relatively compatible to all major music production software, and is meant for common applications that come with most systems. The 8 channel control surface is an extension of the product that enables a larger workspace to fall under feasible for most users out there. 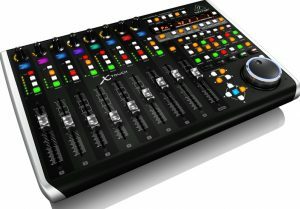 The touch-sensitive feature, 50 master buttons, 8 V-Pots and motorized and touch-sensitive faders make this one high-end. The Behringer B-Control BCF-2000 is a 100-mm, 8 ultra precise set that comes with motorized faders. Only a few similar products come with this high of resolution as this product comes with 8 dual-mode, encoders that also come with feature LED rings. 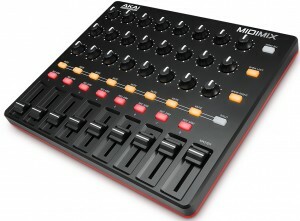 In addition, the state of the art desktop MIDI controller comes with an analog that feels easy to use for the user. The product comes with more than one multi-function foot switch and foot controller connectors that can be used for various MIDI data. This is a hard product to overlook as the configurable MIDI and USB modes add for great flexibility system integration. Various reviews have come back praising BCF-2000 for its expandability. Depending on your music production software support, various units can be used together allowing the user to work in multiple spaces at one time. This is one of the best control surfaces for the money and can be found either online or in your typical music store, not to mention made by one of our favorite brands out there. This is only for the serious musician. This analogue console comes with an Ethernet-based DAW control surface that adds for flexibility and precision for audio content. The Focusrite Control 2802 is an excellent choice for musicians who particularly enjoy the use of a large studio, or for those who just need more room to work with. 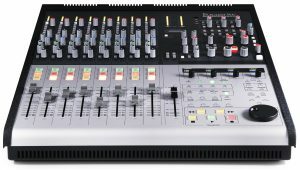 The Ethernet-connected HUI control layer gives this console a DAW operation. Large format is the only console that this product comes with, there is generally not many options for a smaller one. The size of the product makes it one of the most versatile and best control surfaces on the market and comes with a nice texture. It is particularly unique as it comes with a wide range of quality analogue features that all come in the same frame, such as transparent Class A mic preamps, 10-LED channel meters, Alps faders, stereo mix bus compressor, and a bunch of routing options. There is not a whole lot like this Control 2802 controller in the market, especially within the professional realm for those who even know what some of these terms and features mean. The different, unique in design PreSonus Fader Port tops off our list and has been specifically designed for the user looking for the best control surface who needs flexibility and an on-the-go type of controller. This control surface enables window selection that also comes with play, stop, and record functions. Markers are also easy to manage as the punch in and out also contains a footswitch, however, typical products require purchasing the footswitch separately. If this product is used properly, you can customize it while using your own mappings, while basically using any plug-in parameter of your liking. It is always important to have a great feel, as discomfort while recording can be numbing for musicians. This surface is not only reasonably priced, but is convenient for anybody who brings it to life. 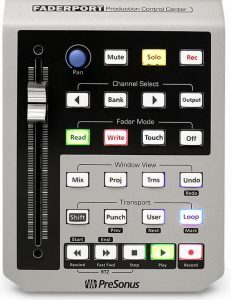 Another beauty of this product and why it is one of the best control surfaces in the world is that it comes with virtually all DAW programs, which allows for this product to record amazing fades also write single-channel or grouped-channel volume, mute, and pan automation at the click of a button.